Are you consistently getting the business results that you desire? What if you had a model that easily conveyed how you create the results that you experience each day? What if you could gain insight into the patterns of your thinking and behavior that serve you as well as the patterns that do not? What possibilities might be open to you if you could learn to run your system rather than having it run you? The Results System™ allows you to gain these benefits by providing the framework, tools and solutions that raise the bar and drive results. The Seven Principles of Extraordinary Results provide a simple introduction to the key concepts behind The Results System™. What is the outcome that you desire to achieve? Start first with defining your end result and work backwards from there. You create what you focus on. It’s important to make a distinction between a goal and a result. When you do not, you run the risk of limiting your choices and options. A “result” is the outcome you want to create. A “goal” is a target or milestone designed to achieve the result. For example, when you say, “I want to reach my sales target for the quarter,” you might think you are describing a result. In fact, this is actually a goal. The result is what you will have when you achieve your sales target, such as financial stability. Choose your actions wisely. Often, you might feel you are making progress when you can check items off of a list. Yet, you may end up wasting time by leaping too quickly to action and completing tasks that are not fully aligned with creating the results you desire. Remember that everyone has blind spots and other factors that are not yet visible. Take time to become more self-aware to reveal the aspects that are operating behind the scenes. Doing so drives better choices and actions. All humans have a unique and wonderful “operating system” that creates unconscious repeatable patterns of thinking and behavior. Having such a system allows you to motor throughout your life without having to consciously think about each step you need to take to complete daily tasks like getting ready in the morning or driving your car. Over time, these patterns of thinking and behavior become invisible and operate behind the scenes. In most cases, they serve you well. Yet, when you want to change in order to get a different result, these automatic patterns kick up a fuss. In order to dissuade you from changing, there are even three lines of defense to keep you from making a shift: remaining invisible, making change awkward, and telling us stories in our own voice that convince us that change would not be beneficial. Any change that you set out to make has an emotional component to it. To create change that lasts we must deal with the inevitable feelings that will come up. While initially you might start off positively fired up about making the change and are certain you will be successful, the actual practice of creating new habits and permanently changing your behavior may cause you to swing from confidence to doubt to hope. When you experience this roller coaster, it may be enough to have you give up and go back to your old habits. Keep in mind that the emotions that arise are all a natural part of the change process. In knowing that, you can design strategies to manage the emotional ups and downs and achieve the result you want. Take a systems based approach to creating your results. 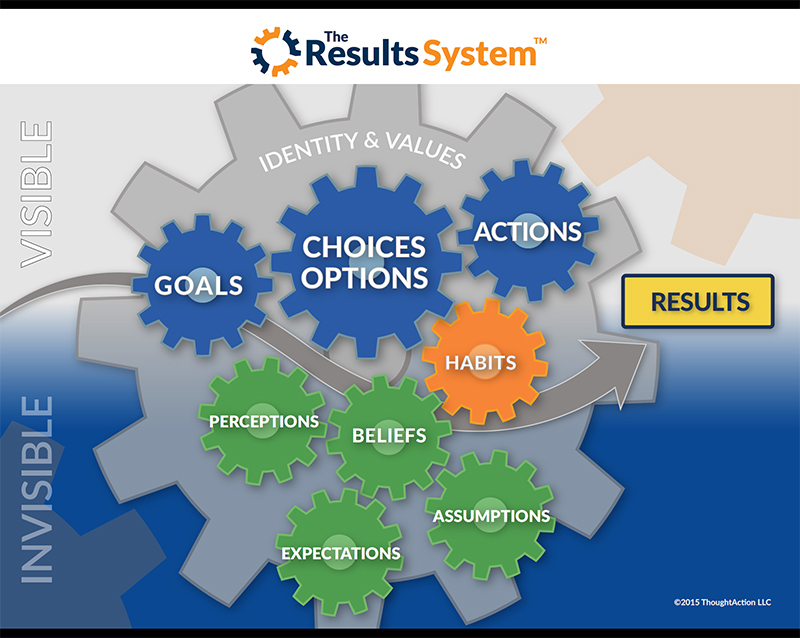 The Results System™ model helps you to reveal the visible and invisible factors that drive your ability to create results. Your Results System™ is unique to you. Even teams and organizations have a Results System™. Using the model will create greater self-awareness around the strengths and the detractors that impact your results and provide you with a means to make conscious choices and choose the actions that support the achievement of your key outcomes. Are you willing to make changes to achieve the result you desire? If so, what action(s) are you willing to commit to in the next week to help you achieve this result by implementing the above principles into your life and work? If you would like to learn more about how you can reveal your own Results System™ and develop strategies to create the results you desire, please reach out to me to discuss how this system can help you in all areas of your life. Adapted from “Seven Principles of Extraordinary Results” by ThoughtAction, LLC, 2015. Adapted with permission. About the Author: Sherry Dutra is a Talent Development and Career Coach and Facilitator who believes we each have far more potential than we typically tap in to. She helps you learn how to step into your full potential so you can create consistent, optimal performance for yourself and your team with less stress and more enjoyment. If you would like to uncover and address hidden challenges that may be sabotaging your success, leverage your strengths, and accelerate your progress toward the results you desire, contact Sherry for a complimentary consultation.